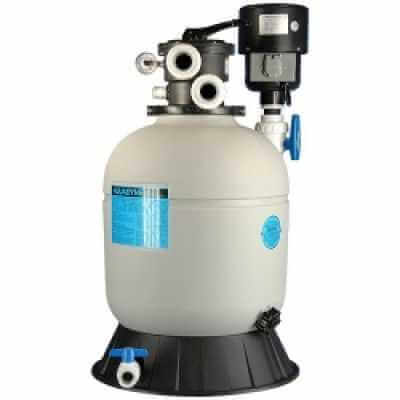 The Aquadyne 4000 - Model 1.1B filtration system is the most efficient and most maintenance free system ever introduced to the industry in such a small package. Just check the performance data list in this listing. The AD4000 can also be used with submersible pumps with ease. The Dynamax blower aggressively agitates the debris collected in the media bed and suspends it in the water column which is easily backwashed to waste. With the blower this unit will use about 30 gallons per backwash. The Model AD42000 will support up to 85 pounds of fish while feeding once per day. The AD4000 is excellently suited for medium to moderately sized indoor large volume aquariums or more heavily stocked laboratory research applications. Also works exceptionally well for medium to moderately sized aquatic environments for alternative species exhibits. Remember, when setting up indoor units it is always a good idea to install the water pump and filter body inside a tray with at least 2" tall sides. You can get a water alarm from a Depot store to place inside the tray that will alarm in the case of an accidental leak from the plumbing or pump. This can save you against a messy indoor cleanup. High quality quick disconnect unions are included.